The mission of the department of music is to provide students a personalized learning environment to foster meaningful cultural experiences in the performance, understanding, and appreciation of the discipline and art of music. Affirm integrity as represented by and in the performance of music, as an example of the highest in human aspiration and artistic truth. Develop an analytical, creative, and intuitive understanding of music as a universal, pan-cultural language. Develop an understanding within students of the value and inspiration that music provides in supporting cultural and societal unity, and enhance the ability of students to develop critical cognitive skills. Afford students opportunities for cultural and aesthetic experiences through active participation in music which will enhance their understanding and appreciation of the arts. 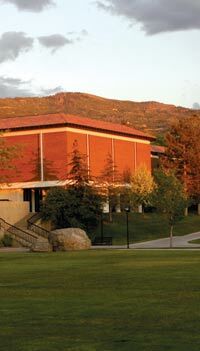 Enhance cultural and aesthetic experiences for the University, Community, Southern Utah, and the Region through the development of excellence in the field of music teaching, and in the presentation of recitals, concerts, musical and operatic productions, workshops, festivals, competitions, and master classes. The department provides instruction and experiences appropriate to its degree programs; provides coursework in music for general education and music performance; and produces musical events and concerts which enhance the cultural opportunities for the campus and community. demonstrate a level of technical and artistic proficiency that is on par for the national standards for success in graduate school. have designed and executed musical events such as solo recitals with a level of professionalism that is on par for graduate study. demonstrate a deep and broad understanding of the literature in their field. a far-reaching exposure to and knowledge of literature in their area of expertise. knowledge of multiple pedagogical approaches in their area of expertise. contribute to the community and the profession through performances on a professional level. promote appreciation of art music within the society. have an understanding of the role of music in society. participate in cultural experiences which will enlarge multicultural understanding. possess an understanding of the responsibility of building the audiences of the future. have a far-reaching exposure to and knowledge of literature in their area of expertise.